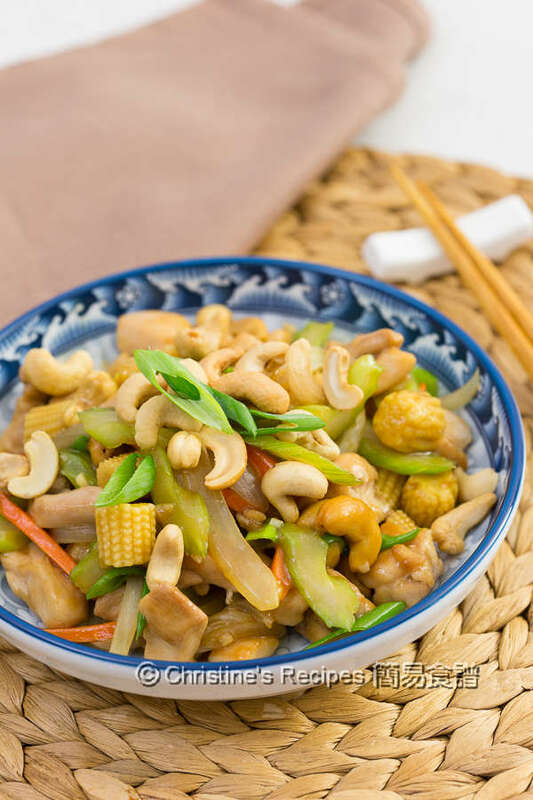 Ever tried adding some crunchy cashews in your stir-fried dishes? 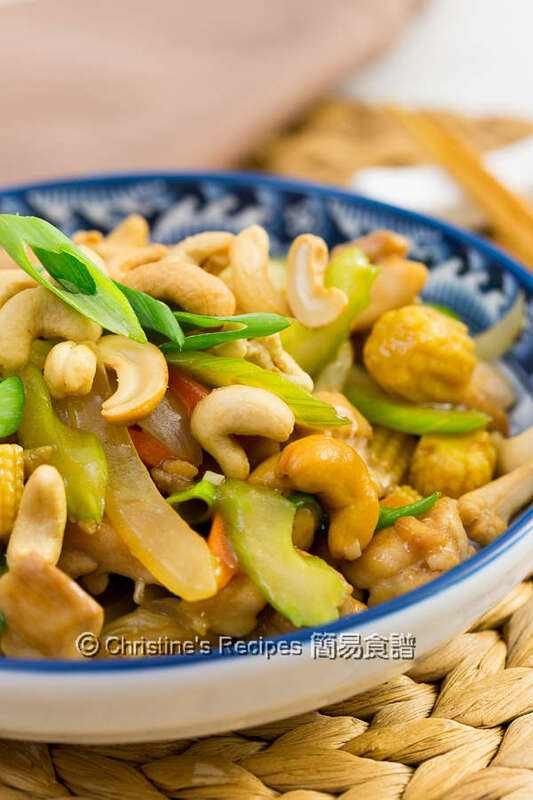 I grew up with this traditional stir-fried dish, cashew chicken stir-fry. It’s good for a daily meal or even family gatherings. 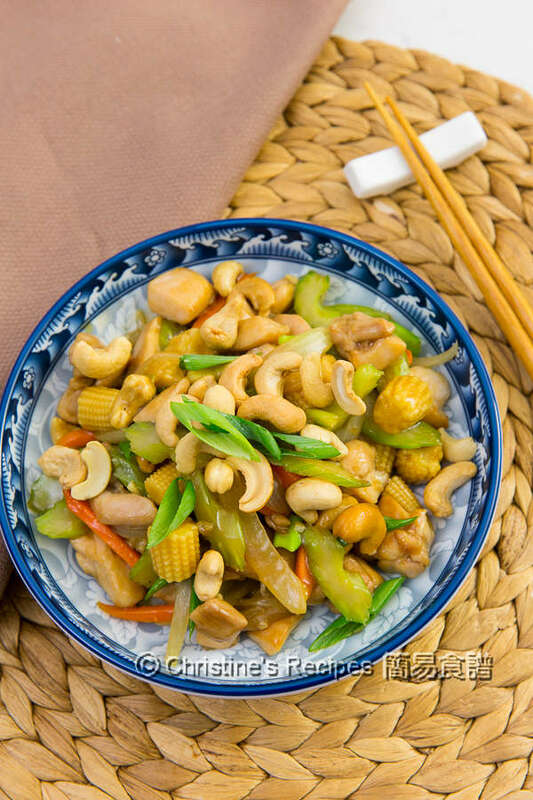 Cashews will add an interesting texture and make a contrast of the tender chicken meat. 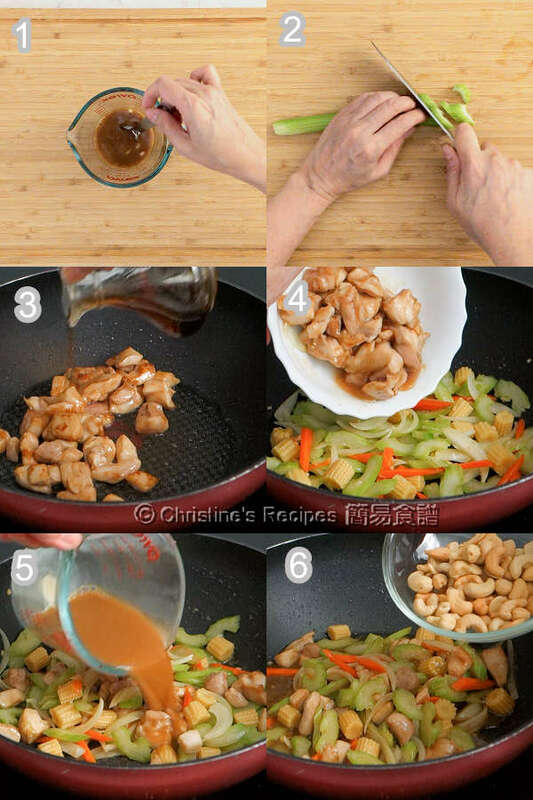 You can use any vegetables for the stir-fry instead of using celery. It’s very easy to make and flexible for you to add any vegetables you like. 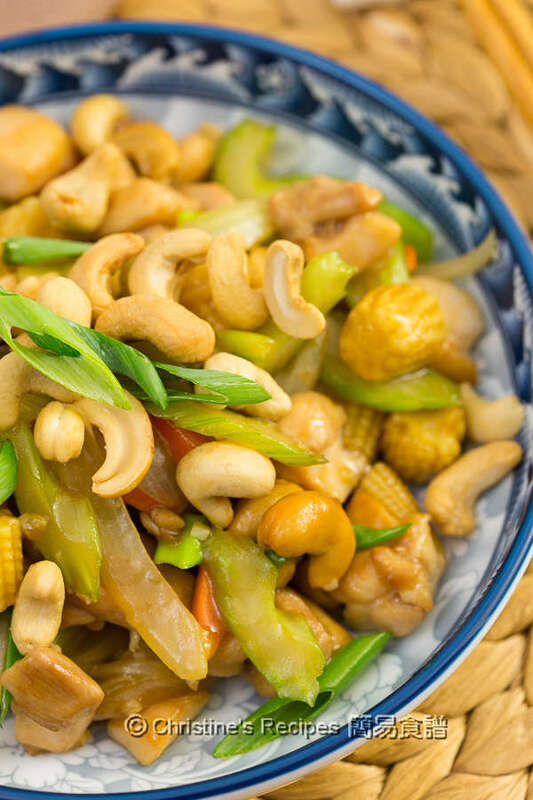 In traditional Chinese cooking, cashews are often deep-fried in oil in order to make them crunchy. If you have an oven, simply bake them in an oven. Or pan-fry them in a pan without any oil. The result will be equally crunchy, and you can consume less oil. As for chicken meat, I like using chicken thigh as the texture is good for stir-frying and the price is cheaper. You can use chicken breast if you want. It won't make any difference in taste. I used celery. Celery is just like coriander. You like it or hate it. So if you don’t like celery, feel free to use your own favourite vegetables, like capsicum, asparagus, green beans. I used to tear away the tissues inside celery before cutting and cooking. By doing so, the celery will be so crisp without any woody texture. Check out the video below and see how I tear away the celery tissues. This dish is perfectly served with steamed rice. Cut chicken into bite-sized chunks. Mix with marinade for about 15 minutes. With a knife, tear away the tissues from celery. (Please check the video out.) By doing so, you won’t taste any woody texture while consuming. Chop celery into thick slices diagonally. Cut the carrot into thick strips. Drain out the baby corns from the can and discard the water. Chop them into chunks. Set aside. Heat oil over medium heat. Add chicken and stir fry until the colour changed and cooked through. Sprinkle Shaoxing wine. Stir to combine. Set aside. In the same pan, add oil. Saute onion, garlic, carrot and celery. Add baby corns. Toss back the chicken. Stir to combine. With a lid on, Cook about 1 minute. Remove the lid. Pour in the sauce and combine. Cook to your preferred consistency. Remove from the heat. Stir in the cashew. Garnish with spring onion. Serve hot. Enjoy! It’s a quick meal. I used the store-bought baked and unsalted cashew from a nearby supermarket. If you use raw cashews, you can bake them in a preheated oven at 180C/350F for about 10 minutes, or until they are lightly brown. Beware not to wait until too dark as inner cooking will continue after you remove them from the oven. Or you might use a lightly heated wok without any oil to pan fry them. Baked cashews are much healthier than deep-fried ones. Yet they are equally crunchy and tasty.